I am honored to review a t-shirt from Nachomama. They have so many shirts to chose from 80's Tee Shirts, Girl's T-shirts, St.Patricks's Day T-shirts, and more. 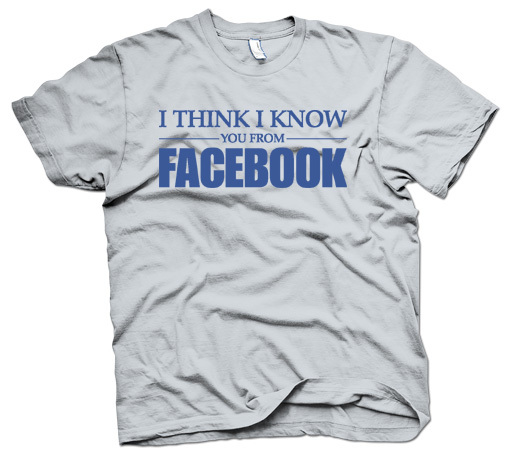 I choose for this review the I think I know you from Facebook under the BEST Sellers T-shirt category. This shirt retails for $16.99 but now on sale for $15.29. This shirt is different then other shirts it feels nice the material is very soft. This shirt is super cute and basically it's saying how popular Facebook has become this is a great shirt for anyone males or females. 1 lucky winner will receive a $15 dollar gift card to Nachomama via Email but will be issued through crazydogtshirts.com. You can not have received a promotional offer within the past 90 days, or own a review/giveaway blog of there own. Disclaimer: This company sent me out this product in exchange for my honest opinion. These are my opinions. If I won I would choose the Schrute farms beets t shirt! My hubby would LOVE THIS! If I won I would choose, "There's a Ninja hiding in this shirt" and give it to my friend for one of his wedding presents!